What is the long-term health impact of pharmaceuticals in our water? 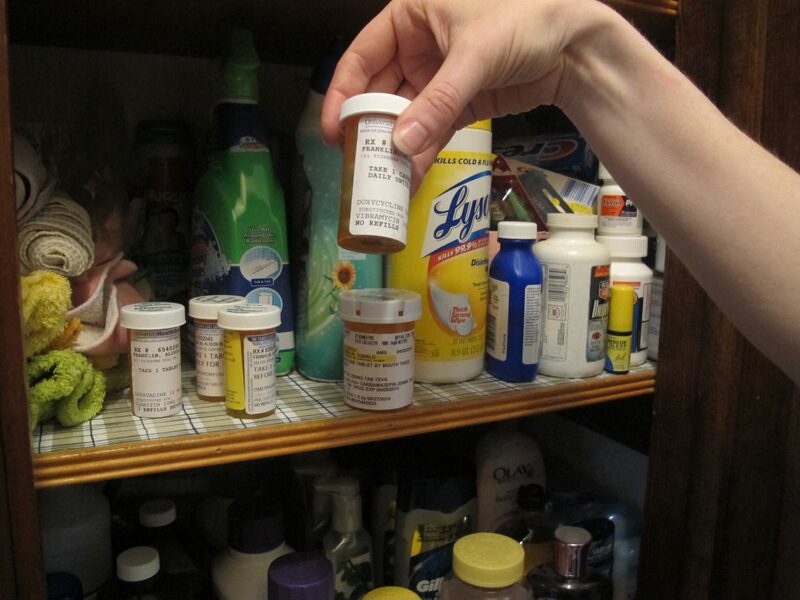 Penn State researcher Alison Franklin holds up one of five prescriptions in her closet at home in Bellefonte, Pa. Flushing old pills down the toilet is how some pharmaceutical compounds get into our water systems. Most of them pass through our bodies when we take our medications. Penn State University’s wastewater treatment plant in State College, Pa. takes in waste from about 46,000 students and 100,000 more people on football weekends. Plants like this one are not designed to remove pharmaceuticals. 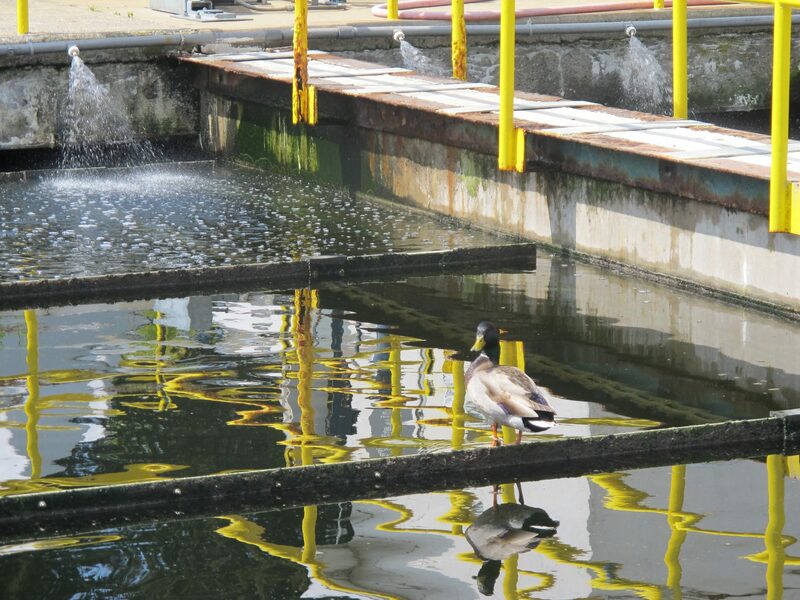 A duck perches on a ledge in the chlorine contact tank at Penn State University’s wastewater treatment plant in State College, Pa. This is the last step of the treatment process before the water is sent to the Living Filter. 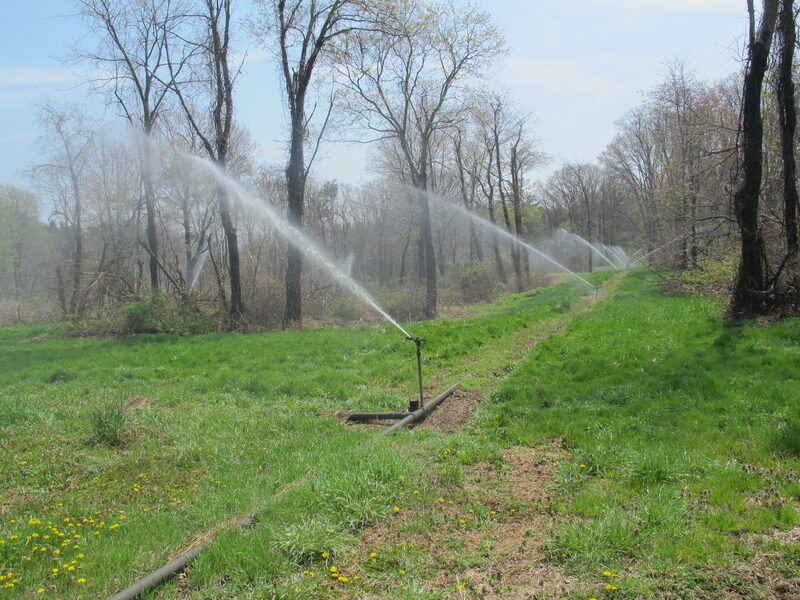 Sprinklers spray treated wastewater to irrigate the forest at the Living Filter in State College, Pa. The water comes from Penn State University’s wastewater treatment plant to irrigate the forest. Penn State graduate student Alison Franklin fills a jar with water from a sprinkler at the Living Filter in State College, Pa. Franklin will test this water sample for traces of antibiotics. At our discussion forum on the Susquehanna Watershed in January, a number of you asked about what we know about the drugs we take getting into our waterways and our drinking water, and whether they could pose a threat to humans or the environment. StateImpact Pennsylvania set out to find some answers. Scientists have been detecting traces of pharmaceuticals in our water systems for about 30 years now, but the research shows no one is getting a full dose of say, Prozac, just from drinking tap water. However, scientists do wonder whether these compounds may be having more subtle, long-term impacts on human health. “We don’t have an answer to that and there’s really no good research out there that says ‘yay’ or ‘nay’ at this particular time,” said Julie Becker, a public heath researcher at the University of the Sciences in Philadelphia. But scientists are looking for answers. 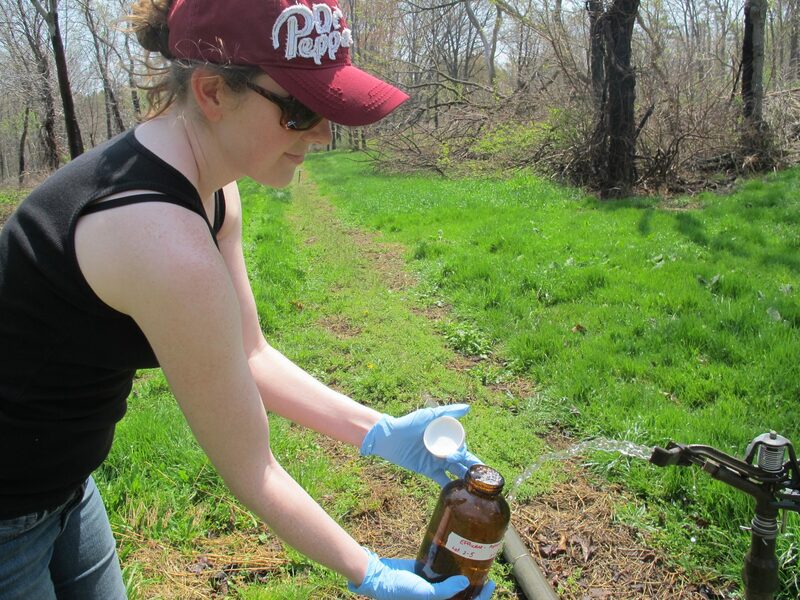 At Penn State University, graduate student Alison Franklin and Professor Jack Watson are studying whether the presence of drugs in our water could be contributing to a major public health problem: bacteria that have developed resistance to popular antibiotics. First, they are trying to figure out how much of these antibiotics are getting into the environment. 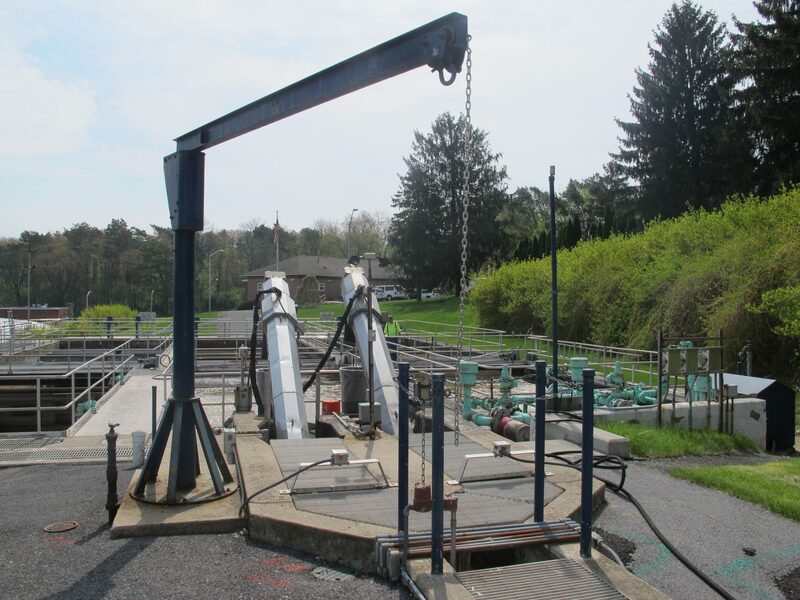 At Penn State, treated wastewater from the university’s own plant is sent to what’s called the “Living Filter” through underground pipelines. There, wastewater is used to irrigate wide, grassy fields and groves of trees through rows of carefully placed sprinklers. The water trickles down through the soil and eventually makes it into the groundwater that the university community drinks. That’s where researcher Alison Franklin takes her samples. Back in the lab, she tests the water for the presence of two antibiotics: bactrim – used to treat urinary tract infections – and ofloxacin – a treatment for bronchitis and pneumonia. While the long-term effects of having pharmaceutical compounds in our water systems is not known, scientists do know how they end up there. Sometimes people flush their unused drugs down the toilet. According to Becker, most pharmaceuticals get there by passing through our bodies and down into sewer pipes and septic systems. However, wastewater treatment plants are not designed to remove these compounds. The question is how much of these drugs are making it into our water and does it matter? In January, the Environmental Protection Agency published what’s considered to be the biggest study on this topic so far. Biologist Mitch Kostich and his team took samples from 50 large wastewater treatment plants across the U.S. and tested the water for the presence of 56 different drugs. What they found was mostly reassuring. However, there were some surprising results. One medication – lisinopril, used to treat high blood pressure – showed up at a level that would take you just over a year to consume a single dose. And about a dozen of these drugs were found at levels that the researchers suspect could affect fish, bugs and other aquatic species that live in the rivers and streams where treated wastewater is often sent. Last year, scientists in Sweden found that low-levels of an anti-anxiety drug changed the behavior of fish. Members of Kostich’s team want to examine the impact on these creatures more carefully, but there are scientific limits. “We can’t possibly test every species out there, so it’ll always be impossible to completely rule out the possibility of any effect in any organism that way and we have a similar issue with people,” Kostich said, noting there is not much evidence to suspect there would be a chronic effect on human health. It would also be difficult – and possibly unethical – to study whether traces of drugs in the water may have long-term impacts on more vulnerable populations, such as children, pregnant women or people who are allergic to certain drugs, he added. Another question researchers are asking is how to keep pharmaceuticals out of our water systems in the first place. However, that doesn’t address the fact that most pharmaceutical compounds are getting into the water through our bodies after we take them. For that, public health researcher Julie Becker says we may need to turn “upstream” to the pharmaceutical companies that manufacture our drugs. In Europe, some companies are designing drugs so that the active ingredients stay in our bodies where they are useful. “We want to make sure that we absorb more of the drugs, so that when we go ahead and eliminate, we’re not eliminating as many drugs,” Becker said, noting doctors can also play a role by limiting how much they prescribe at one time. Even so, Penn State researcher Alison Franklin tries not to think about what’s in her water.